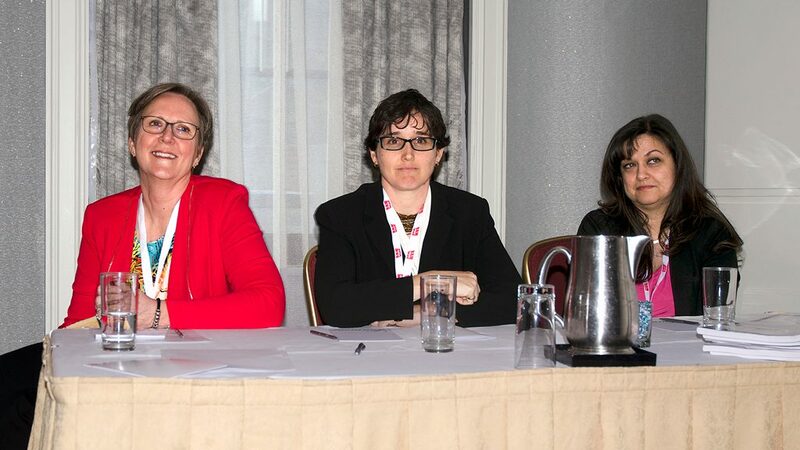 Angela Gismondi/From left, panellists Moreen Miller, president of Fowler Construction, Jennifer McArthur, assistant professor at Ryerson University and Lisa Brown, president of the Canadian Association of Women in Construction, shared their views on the challenges women face in the Canadian construction industry during a session at the Ontario Road Builders’ Association Convention Feb. 5 in Toronto. Fowler Construction president Moreen Miller says while she has had a successful career in the industry, she is discouraged to see that more women haven’t chosen to enter a field that offers great opportunities. “I can’t tell you how disappointed I am when I sit in front of the plenary session today and I see how few women there are in the audience,” Miller told a group of attendees during a session at the Ontario Road Builders’ Association Convention in Toronto recently. The session, entitled An Operational Approach to Increasing the Participation of Women in Construction, brought together industry, academic and association perspectives to discuss the challenges women in construction face and strategies for improvement. Jennifer McArthur, assistant professor in the Faculty of Engineering and Architectural Science at Ryerson University, talked about some of the experiences she has encountered over the years. As a mechanical engineer, she was only one of four women in a class of 100. She shared the experience of one grad student who just finished a degree in civil engineering and worked as an intern on road projects for a company in Saskatchewan. “It’s not that there was no women’s bathroom, there was no bathroom,” said McArthur. “It never occurred to them that they had to actually provide a bathroom for people to use. Lisa Brown, president of the Canadian Association of Women in Construction (CAWIC) and service manager of power systems at Toromont Cat, spoke about the Level Best project, an advancement project for women in construction that CAWIC launched last year. “The idea was to assess the needs of females who work in the construction industry and to develop, in collaboration with industry stakeholders, a targeted, measurable action plan with recommendations to increase the hiring, retention and advancement of women in construction,” said Brown. While women make up 54 per cent of the workforce in Canada, the construction industry doesn’t reflect that. Phase 1 began with a needs assessment to learn what is affecting women in the construction industry. The second phase of the project included the Level Best Industry Action Plan and a series of action items, tools, templates and resources for how to operationalize making these strategies happen. Examples of tools, Brown said, are mentorship program development, work life balance supports, anti-harassment and discrimination policies and procedures, statistical data collection and analysis and gender diversity training. “It’s great that we’re speaking about this, but the next step is to do something about it,” said Brown.